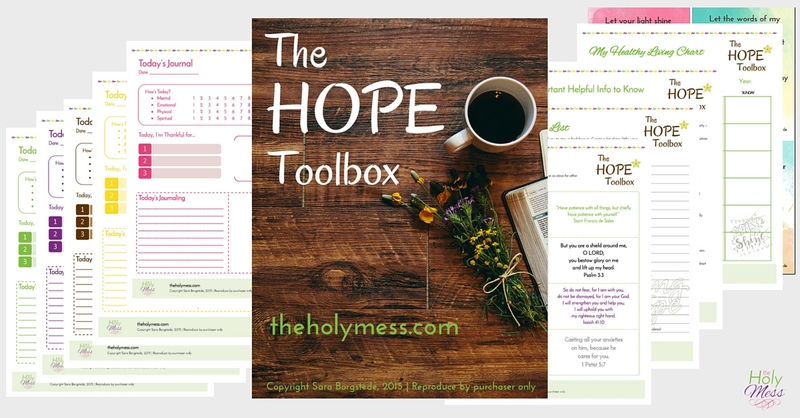 Refresh your spirit and find encouragement with this beautifully designed printable kit for depression & sadness, My Hope Toolbox, which you can download now. Depression and sadness hit hard, yet God offers us peace. This tool puts resources you need for wellness right at your fingertips. 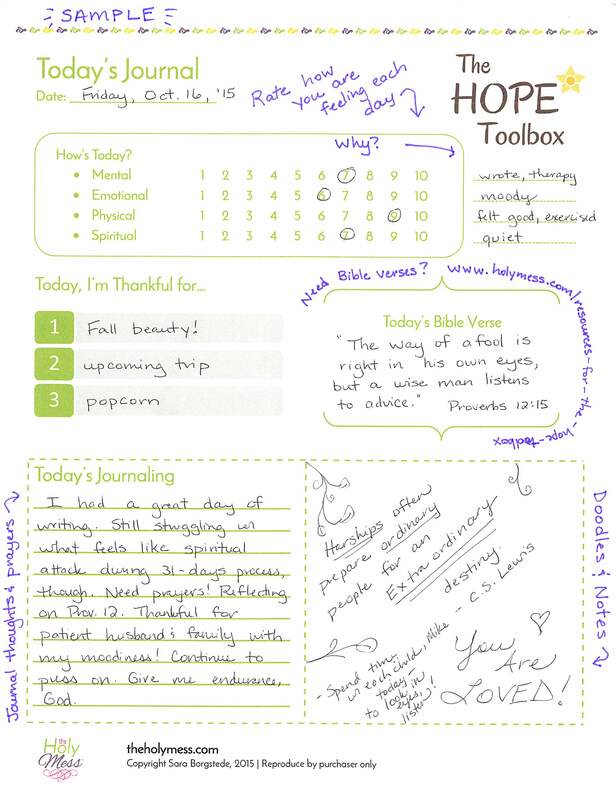 Deepen your faith life.Write down meaningful quotes and Bible verses for you. Hang them in places you will see them every day, like on your bathroom mirror, in your car, and in your kitchen. I’ve been doing this for years now and it makes a difference. Mine are stuck on my kitchen cabinets right now. 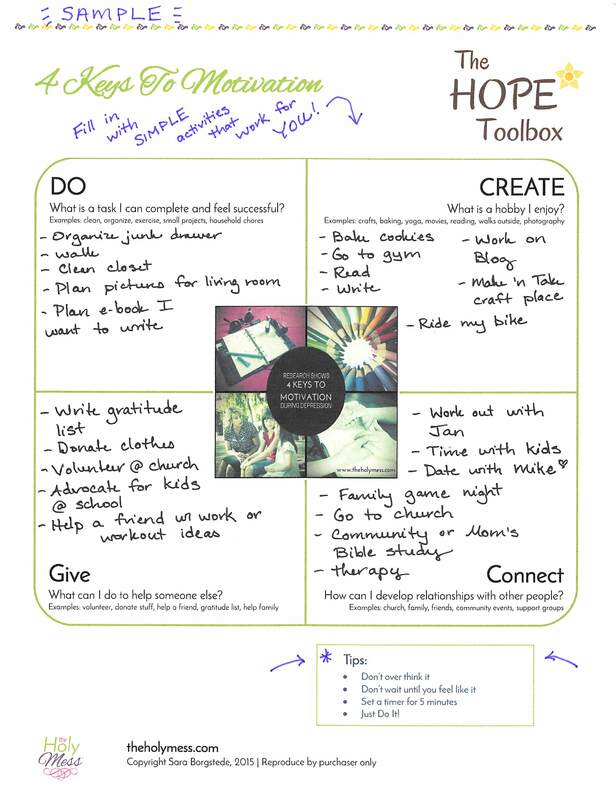 Create your personal Hope List. 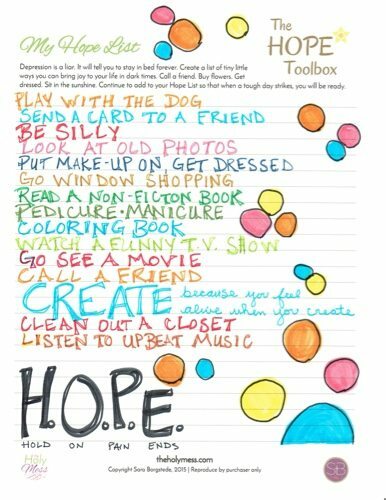 We each need a go-to list of little things to help us make it on the bad days. Sit in the sunshine. Call a friend. Buy flowers. Every day during the month of October I’ll be posting resources and ideas. Create a list of what works for you. Note: This product is a digital download, so you print it and begin using it immediately! Print and staple, or put into a folder. I three hole punched mine and put into a binder. Use this a variety of ways to enhance your personal time or Bible quiet time. Daily Journaling Pages, in 5 color choices! Would you like to be an affiliate for this product? Click here for more details on our affiliate program. Questions? Feel free to contact me at any time! 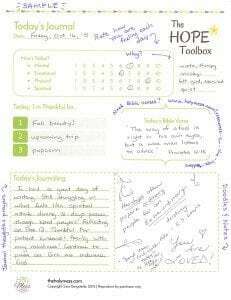 Click here to return to The Hope Toolbox #write31days series of blog posts. 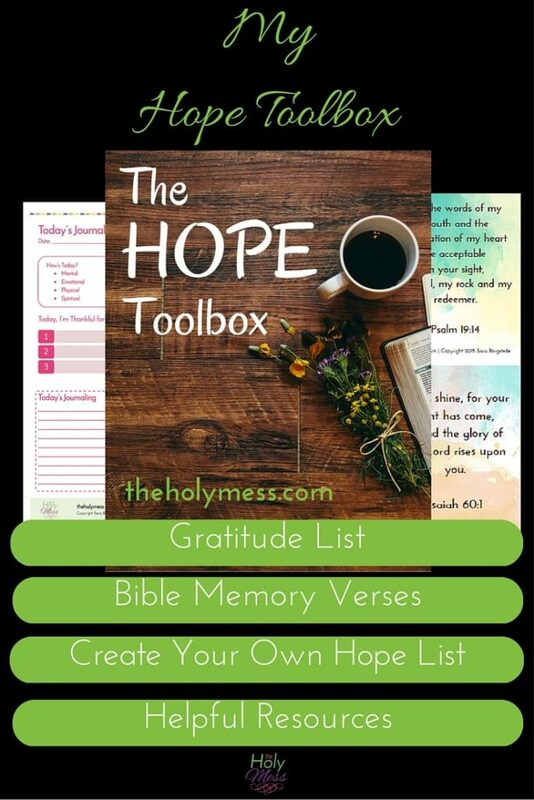 A few additional freebie printable pages to add to your My Hope Toolbox! NEW! 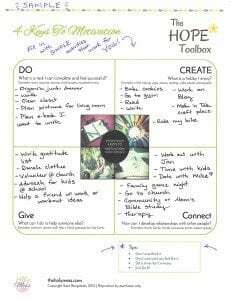 All the resources from The Hope Toolbox series in one handy location: Resources for The Hope Toolbox Series. 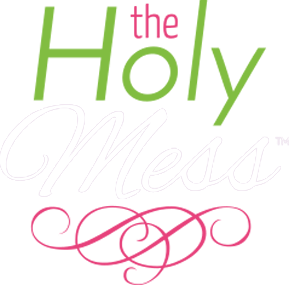 Includes daily journaling prompts, Bible verses, and a HUGE list of clickable link resources. Please note: I am not a therapist or expert. I encourage you to seek the help of your doctor or therapist for more specific information. 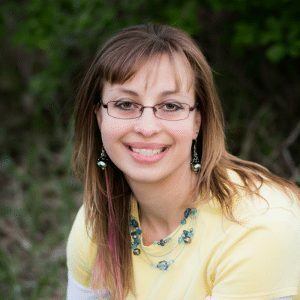 Start here: NAMI: National Alliance on Mental Illness to find resources, support groups, information, and more.